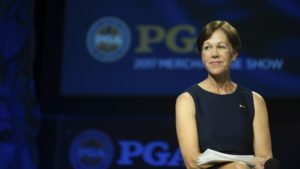 PGA Master Professional Suzy Whaley was elected the 41st President of the PGA of America on Friday at the Association’s 102nd Annual Meeting. Whaley is PGA Director of Golf at Suzy Whaley Golf in Cromwell, Connecticut; and PGA Director of Instruction at the Country Club at Mirasol in Palm Beach Gardens, Florida. A pioneer in the golf industry, Whaley is the first woman to serve as a PGA Officer in the roles of PGA President, Vice President and Secretary. Recognized as one of the country’s top instructors, Whaley previously enjoyed a five-year tenure at Jim Flick Golf Schools, before becoming the Head Golf Professional at Blue Fox Run in Avon, Connecticut, in 2002. From 2004-06, she worked as an LPGA golf commentator for ESPN, and began her own instruction and coaching business, Suzy Whaley Golf, after ESPN. PreviousPrevious post:BYU’s Peter Kuest Cards Course Record 61 at Poppy HillsNextNext post:WGANC Member Lori Boettler Gets Hole-In-Ones Right and Left-Handed!